Among the nine provinces (also called "도" in Korean) of South Korea, Gangwondo is the most rugged and mountainous. With chains of peaks and hills scattered throughout and little arable land, the generally impoverished citizens of this rough province has mostly resolved its dietary needs through mountainous roots and vegetables and the seafood from the East Sea (동해). Despite its harsh landscape and terrain, I've found it to be one of the most naturally beautiful areas in Korea with its majestic mountains and crystal clear seas and I've fallen more in love with Gangwondo each time I've visited. My roommate's sister works as a public service officer and was able to secure a few nights at the Geumgangsan Condo (금강산콘도) in Goseong (고성) county this past winter. Originally a group of some five of us were set to go but it ended up being just the three of us for a relaxing and fun, and of course, food-filled trip. Located all the way on the very northwest tip of South Korea, Goseong county is the most north you can get within South Korea and the Geumgangsan Condo lies just a few kilometers south of the North and South Korean border. While I had visited areas in the immensely-sized Gangwon province before, it was always in major cities such as Seokcho and Gangneung, so this marked my first time making it up so far north to Goseong. 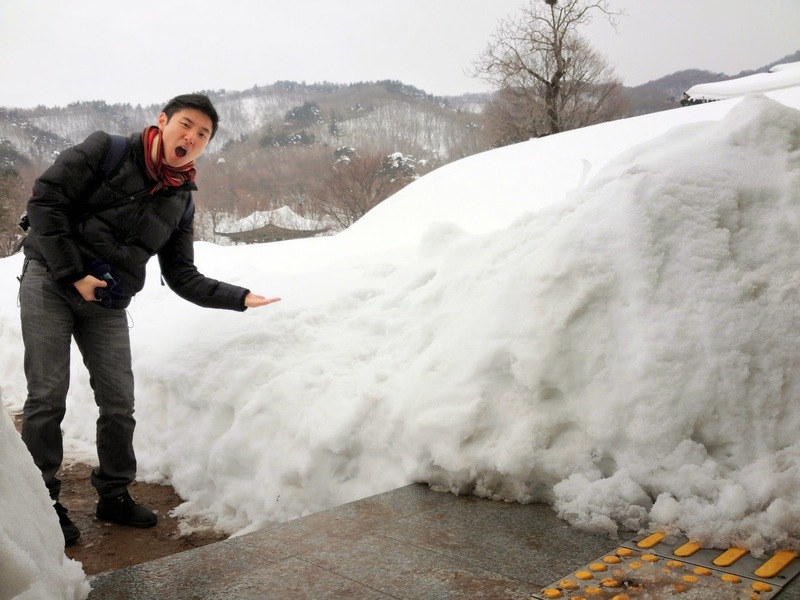 We were quite worried in the days leading up to our trip as Gangwon province experienced an unusually high volume of snow with fresh snow falling even up to the night just before our trip. Luckily the highways and major roads were cleared diligently by the police, soldiers, and locals and the roads were fine making it possible for us to get from Seoul to Goseong without a hitch. That wasn't to say Gangwondo wasn't a winter wonderland as everywhere you looked around, the land looked like Elsa had just run through it. Let it gooooooooooo, let it goooooooooooo! Wanting some seafood but nothing too heavy on our first night we arrived, we hit up Geumgangsan Hwoe Jib (금강산 횟집)- a famed and popular seafood establishment in the area which also was recommended by the Geumgangsan Condo. Located right along Daejin Port (대진항), the brightly lit store sits along a row of other seafood restaurants but even on our visit, Geumgangsan Hwoe Jib was clearly the busiest. The front row is lined with buckets and tanks full of all sorts of fishes and other seafood, fresh from the East Sea and the only fresher way of getting seafood here would be if one was to to actually go out on a boat at dawn and then prepped and ate his/her catch at sea. Marine biology lecture or dinner? My roommate's sister wasn't able to join us in Gangwondo until the next day so my friend and I contemplated whether we should place an order for hwoe (sashimi) but reasoned (a rarity in meal times) to not let our hunger overcome our stomach capacities for two. So we went for a mool hwoe and hwoe deop bibimbap. The banchan spread is a lot bigger if you order the hwoe but is still sizable, with many of them seafood based, for the other ala carte menu items . The grilled salmon (?) steak side dish was particularly delicious and would have been a fine meal on its own. Mool Hwoe (물회), which is a sweet-spicy broth-based seafood dish, doesn't skimp out on the seafood here with plenty of fresh cuts of fish, sea squirt, and other seafood goods piled on. The key to a good mool hwoe is the quality of the seafood that goes in it and it was absolutely top notch here. My friend, who goes down to Pohang for work sometimes- where mool hwoe is arguably most famous in Korea- even proclaimed it was the best mool hwoe he's had and even better than the ones from Pohang. I went with the hwoe deop bap (회덮밥) which is a bibimbap with hwoe and the seasoning sauce cho gochoojang-based, which is more tart and sweet. Again, the hwoe wasn't skimped out on here with a big old mound of pink, tender, flesh. After dumping in my bowl of rice and some of the cho gochoojang, I gave it a big old mix. It's always a pleasant sensation to eat hwoe deop bap with the mix of soft hwoe, steamed rice, crunchy vegetables all coming together in the tart and sweet, spicy sauce. An occasional kick from the pepper slivers gave a nice oomph. My only complaint was the overload of minced garlic. I think a full tablespoon and a half of it must have gone in here and I love me some garlic but it was way too much for one hwoe deop bap. I would advise you to take out some of the minced garlic before mixing and eating! I love me some good-quality makgeolli and I couldn't drop by the area without sampling the local makgeolli so we picked up a few bottles to take home and try. The far left was the one my friend liked the most. It had a bit of a dark aftertaste and less sweet than the other two. I would imagine it would be popular with the ajoshis after a mountain hike. The one in the middle tasted exactly like the popular saeng makgeolli brand in Seoul and we later found out it was from the same company anyway so it's not worth going out of your way to try. The last was my personal favorite and really did taste like corn although a tad bit sweet. Perhaps I overestimated the bottles we could drink the previous night; although I was fine (I rarely get hangovers) but my friend, who also was the driver, was not in his best spirits the next morning... Unfortunately, the downside of staying in a small town like Goseong, and especially in the isolated Geumgangsan Condo at that, is that you're situated quite a few kms off from the bigger cities. Starving but not really in the mood to drive out, we grabbed breakfast in the condo's restaurant which was ok, but predictably pricey. Dried pollack, called 'hwangtae' (황태) in Korean, is a specialty of the region and is said to especially be muy excellente after drinking. After being boiled with radishes, soybean sprouts, and other simple veggies and seasonings, the broth takes on an opaque hue. The bits of dried pollack is softened considerably from the boiling and has a simple, lightly salted taste without any fishy smells. Again, the bowl was a bit expensive at 9 or 10,000 won but what do you expect from a condo restaurant? After sightseeing a bit in Sokcho (속초) and picking up Lita noona from Seoul, we were close to lunch time. Lita noona was recovering from an illness then and was told by her doctor to refrain from eating spicy or salty foods so we took the time to drop by one of the many famous handmade tofu houses in the region. These silken, smooth, and every-so-creamy soondubu (순두부) are a specialty of the region which supposedly utilizes seawater in its creation. Whatever the secret(s) are, the tofu is damn delicious and a great way to satisfyingly fill you up without feeling bloated and heavy from your meal. Dae Cheong Maru (대청마루) came up frequently on the Korean search engines so we selected here as our lunch destination. Located inside a renovated hanok (traditional Korean home), the restaurant is spacious and bustling with customers. We opted for their steamed tofu as well as their plain soondubu and was treated to a tofu feast.The banchan spread here included fermented squid, seasoned pollack (didn't I say it was a specialty around here? ), seasoned root vegetables, pickled perilla leaves, soy sauce shrimp, seasoned zucchini, pan-fried tofu, and biji jjigae (비지찌개 or puree soybean stew). The in-house firm tofu was also a delight- so tender and yet with just a bit of spring to the touch. They still retained the scent and tastes of their original soybean form but in a more subtle way making the tofu much more complex than any store-bought tofu blocks. I should say, Daecheong Maru gives a lot of food for its inexpensive prices too. We ate our fill and still had a block of tofu and some of the soft tofu leftover which we stored in our condo fridge and enjoyed as a simple breakfast the next day. The city of Sokcho is almost 30 km from Goseong and takes about an hour by car to get there so it's perhaps not very reasonable to come all the way out here to eat if you're staying in Goseong. But if you're exploring Sokcho anyways or in the vicinity (Sokcho is a much bigger city than the town of Goseong), then I'd definitely recommend stopping by here! A few other specialties of the Gangwondo region comes from its famed buckwheat (maemil or 메밀). Whether made into jeon, added to dumpling wrappings for giant, fist-sized dumplings, or cranked out into noodles, the nutty and earthy taste of buckwheat draws visitors in to the many buckwheat restaurants of the province. We went for the buckwheat dishes for our second night's dinner, stopping at a popular place called Bak Posu Garden (박포수 가든). Bossam, mook, and tofu are all offered here but the big draw of the place is their maemil mak guksu (메밀 막국수) and fist-sized maemil dumplings (메밀 왕만두). As most buckwheat restaurants do, buckwheat tea was offered by the kettle as the complimentary drink here which supposedly helps in digestion and such. My friend's maemil dumpling soup was a good warmer for the chilly evening. The broth was accentuated with the toasted seaweed crumbles, fried egg slices and ground sesame seeds. You begin by taking a big ladle of the icy dongchimi (recipe here by the way) that's provided and scooping a big ladle or two of the tangy-sweet broth onto your noodles. Then add vinegar, sugar, sesame oil, and mustard to your liking and mix. And after. It's a hodgepodge of dongchimi guksu, bibim guksu, and maemil that comes together in a refreshing manner. You would think with so many flavors (tart, sweet, salty, spicy) that it would be a discord of tastes but you'd be surprised how well it works together. The dongchimi, I might add, was a tad sweet for my taste so I skipped adding any additional sugar but otherwise a most delightful bowl of noodles. Just have a bite of dumpling in between and you are set. Our final day we enjoyed the pristine and beautiful Gangwondo coast and surroundings one last time before embarking on our car trip back to Seoul. On our way back to Seoul, we passed by the town of Inje (인제군) by lunch time and came upon one hwangtae restaurant after another, each restaurants with rows of pollack drying out in the winter sun. We stopped at one called Hwangtae Maeul Shikdang (Hwangtae Village Restaurant or "황태마을식당") for lunch. Anyone who grew up in an Asian household will be unfazed at seeing various seafood either presented or ready for cooking in a whole, head-to-tail state but I'm sure for many Westerners seeing so many of these guys being dried in the open will probably elicit gasps and stares. Seeing as how difficult it is to find some truly good hwangtae restaurants in Seoul, we went with the hwangtae jeongshik (hwangtae set meal) for our lunch which included both roasted and seasoned hwangtae (hwangtae gui or 황태구이) and hwangtae seolleongtang (황태 설렁탕). We were feeling pretty famished by then but we didn't have to wait long before our server came with an array of side dishes that widened our eyes. From pickled leaves to various mountain roots and vegetables to different kinds of kimchi, this was a feast in side dishes alone with its variety. The heavy use of wild roots and vegetables reflected Gangwon province's mountainous terrain and its subsequent mountain nature-heavy cuisine and the server sternly but gently warned us not to waste the side dishes as each and every one of them had been carefully and meticulously cultivated and/or picked from the wild and then prepared in-house. Vegetarians looking to get a taste of some authentic rural Korean cooking would have an absolute feast here. The star of the meal, the hwangtae gui came sizzling on a stone plate and wafting a delicious scent. To the flayed, dried and seasoned pollack, a liberal amount of sweet and spicy coating was applied before being roasted. A simple scattering of sesame seeds and chopped scallions gave it a nice visual appeal. The soft flesh was easy to pry apart with our chopsticks and soon morsels were eagerly popped into our respective mouths. The sweet and spicy exterior had just a little bit of crunch that gave way to the nice, slightly jerky-like flesh within. Fans of the Chinese-style jerky such as Hsin Tung Yang or even American-Chinese dishes such as general tso chicken would hardly find anything amiss with the hwangtae gui both in texture and flavor and it's easily a dish that children and adults can both enjoy. To help wash it all down, each person was also served a bowl of hwangtae seolleongtang. Unlike the clear hwangtae soup I had for breakfast on the second day at the condo, hwangtae seolleongtang takes even longer to prepare. The long hours of boiling draws out all the goodness and flavor from the fish to create a naturally milky-hued soup. Seeing the hwangtae seolleongtang, I was reminded of when I used to work in Yeoksam a few years ago, when my colleagues and I would frequent a famous hwangtae seolleongtang restaurant nearby which was always filled with patrons seeking after this milky and luscious soup. The hwangtae seolleongtang here was also excellent and provided a nice basic contrast to the bolder flavors of the hwangtae gui. The bits of hwangtae within the soup was soft and easy to chew and I would have enjoyed a big bowl of this alone with the rice and amplitude of side dishes. After this particular hwangtae feast, I'm still confounded why so many hwangtae dishes aren't as popular and readily found in Seoul! But a proper and excellent way to get an introduction to this versatile fish is out in Gangwondo! I've said it before but Gangwon Province definitely remains one of my favorite regions of Korea. For decades it's been looked down on by the other provinces as being rugged, rural, and poor but perhaps because of the lack of attention, there's something about the region which has an unspoiled beauty that's difficult to find in the developed and rapidly developing regions elsewhere of Korea. There are raw and untouched aspects of it which hasn't been touched by high rise buildings, neon lights, and soulless developments and the naked beauty of the region makes me feel closest to the Korea of the past than elsewhere. The pitch black darkness of the night, the jagged and massive mountains, and the sparkling ocean reminds me that the spirit of Korea doesn't equate with modernity and hyperactivity as we tend to think nowadays. There are times you are standing surrounded by peaks, oceans, and beautiful terrain and you realize you are standing within the weathered but sturdy bosom of Mother Korea. The same can be said of the cuisine here. Sure, many of the dishes here- from soondubu to roasted hwangtae- are rather simple and doesn't elicit quite the excitement dishes from Seoul and other major regions do, but these are the dishes of tradition and of the Korean people. From the seasoned haenyeo lady (해녀) making her daily twilight dives in the East Sea to make her catch and living to the old couple foraging for simple roots and herbs in the unpaved and wild terrain of the mountains- these are the unglamorous yet hard way of life that many generations have repeated for their sons and daughters and to provide the glimmering face Korea has today. When the pace of life in Seoul becomes manic, the sounds cacophonic and deafening, and everything sensually overloading, Gangwondo comes to mind often as I lose myself to the memory of mountains, ocean, and of course, the simple but delicious food. Hello Stewart, I've been lurking on your blog for a while. It's fantastic. A really good, detailed, obsessive insight into a wide variety of Korean food. Thanks for that. I'll be visiting Korea soon, I used to live there in the late 90's, as I am writing a book about regional Korean food. It'd be great to meet up and eat, if you have the time. I can't find an email address on your site, but I'm on graham dot holliday at gmail dot com and @noodlepie on Twitter. I'll check in here again, but if you could drop me a line in the first instance that'd be great. All the best.